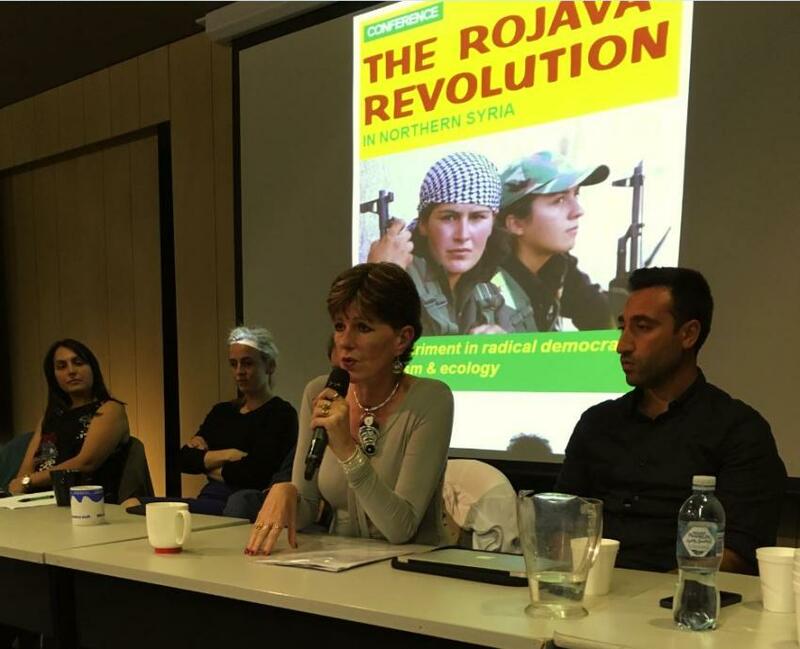 [By John Tully] Solidarity with the Kurdish freedom struggle was stepped up at an inspiring conference held in Melbourne over the June 30-July 1 weekend. The conference, which was held at the Flinders Street campus of Victoria University, discussed the bold experiment in radical democracy, feminism and ecology that is taking place in the Democratic Federation of Northern Syria (DFNS). Most importantly, the conference resolved that “it is a duty of supporters of the liberation struggle in northern Syria to make determined efforts to publicise its inspiring achievements and build practical solidarity with it”. The conference was a resounding success. Some 150 people attended the Friday night public meeting and over 100 took part the following day. The fact that it was officially sponsored by the College of Arts and Education at Victoria University undoubtedly gave a big psychological boost to the Kurdish community, which has long been marginalised, vilified as terrorists, and subjected to police and other harassment. This time, the police were on alert in case the conference was threatened by ISIS goons or Erdoğan supporters! While foot-dragging on visas by the Australian immigration authorities prevented overseas Kurdish speakers from attending in person, Saleh Muslim, co-chair of the Democratic Union Party (PYD) in Syrian Kurdistan addressed the conference and answered questions via Skype video link. Ercan Ayboga, an environmental engineer and Kurdish activist based in Germany also spoke about the ecological situation in Rojava via Skype. Saleh Muslim stressed that the revolution was for all the peoples of northern Syria, not just the Kurds—and that respect for diversity is an imperative if a just and peaceful society is to emerge, he said. Ercan Ayboga outlined the commitment of the Rojava revolutionaries to building an ecologically sustainable society. Both hope to be able to visit Australia in person in the near future. Andrea Maksimovic, the international officer of the ACTU, told the public meeting that the union movement stood for international solidarity and the defence of human rights for all, including the Kurds and other peoples of the Middle East. Michele Harding (pictured), the mother of Reece Harding, an Australian YPG volunteer killed in action defending Rojava from ISIS, gave a moving speech in support of democracy and human rights in Syria. The meeting was also addressed by Cekdar Diger, on behalf of the Kurdish Democratic Community Centre of Victoria, along with Rob Stary and Jessie Smith, prominent Melbourne civil liberties lawyers, who ridiculed the attempts of the Australian authorities to label the Kurdish freedom struggle as terrorist, and promised some legal fireworks for Attorney-General George Brandis. One of the highlights of the conference was the session entitled “Towards a new Syria”, in which contributions by Kurdish academic Sherko Kirmanj and Dave Holmes from Australians for Kurdistan generated a lively discussion from the floor. Both speakers stressed that unless the ethnic mosaic that is Syria is rebuilt as a federal state with full rights for all peoples, there can only be endless chaos. Seval Ulus, the president of the Azadi Youth Society of Victoria, highlighted the centrality of women’s liberation in the Kurdish freedom struggle. Australians for Kurdistan activists John Tully and Rafael Taylor examined respectively the origins of the oppression of the Kurdish people and the future and nature of the Rojava experiment in democratic confederalism. Ismet Tastan and Zerebar Karimi outlined the Erdogan regime’s oppression of the Kurdish people and the monstrous assaults on democracy in Turkey. In another workshop, Tony Iltis and Nick Fredman gave a spirited defence of the Rojava revolution against “left” critics, some of them supporters of the brutal Assad dictatorship, and others armchair critics quick to believe any allegations of abuse by the YPG and the Syrian Democratic Forces. This entry was posted in Australia, Rojava and tagged Democratic federation of Northern Syria, Rojava by AFK. Bookmark the permalink.